Maybe you’re awesome and you can cook rice on the stovetop without it boiling over and/or sticking to the bottom of the pot and/or turning out wet since it didn’t absorb all the water, but for some reason this is a skill that escapes me. Or at least, it escaped me five years ago when I learned the oven method, and I have never looked back. After maybe five minutes of prep, the rice goes in the oven and you don’t have to think about it again until you pull it out, perfectly and beautifully cooked every.single.time. So: Preheat the oven. Measure and start boiling the water. Dump the rice into a baking dish. Sprinkle with salt (stirring with your teaspoon is optional). Carefully pour on boiling water. Cover tightly with two pieces of foil (don’t be stingy like I always am – you deserve that extra inch of foil and you’ll be glad you have it). Put it in the oven and forget about it for an hour! The hardest part is remembering – once the foil is on – that you just put a bunch of boiling water in there, and you shouldn’t slosh it around willy-nilly on the way to the oven! I’m sure some of you are already doing this, or can handle the stovetop method, but this was life-changing for me! And later this week, I’ll show you my very favorite way to use this lovely, perfect brown rice! Preheat the oven to 375. Bring the water to a boil (I use our electric teakettle, or a covered saucepan). Meanwhile, measure the rice into a 8×8 baking dish and sprinkle with salt. Drizzle with oil or dot with butter (if using). Pour on boiling water and immediately cover tightly with two layers of foil. Carefully place in preheated oven and bake for 1 hour. After an hour, Cook’s Illustrated recommends fluffing it with a fork and letting it steam under a dish towel for 5 minutes, but ain’t nobody got time for that around here. You can go the extra mile or just dig in as soon as it comes out of the oven! You can easily double the recipe for a 9×13 pan (like in the pictures above), and that’s what I usually do since extra rice freezes well for those times when you need it quickly! Oooh, that sounds like an awesome idea! Thanks for this one! I am a rice failure. This will help me! Hi Bet! I have oven-cooked brown rice before and it’s definitely the way to go! I notice your little helper in the photos 🙂 is measuring what looks like more than 1.5 cups into what looks like a 9″x13″ pan. Were you doubling or tripling the recipe that day? I am cooking dinner for 30 people soon and thought I’d offer the choice of brown rice vs. white rice. So I was thinking about tripling the recipe (maybe even quadrupling?? ), but am not sure what size pan to use. Would 9×13 be large enough, or should use something bigger like a roasting pan or of those big foil pans? Would appreciate your thoughts! Hi Chris! 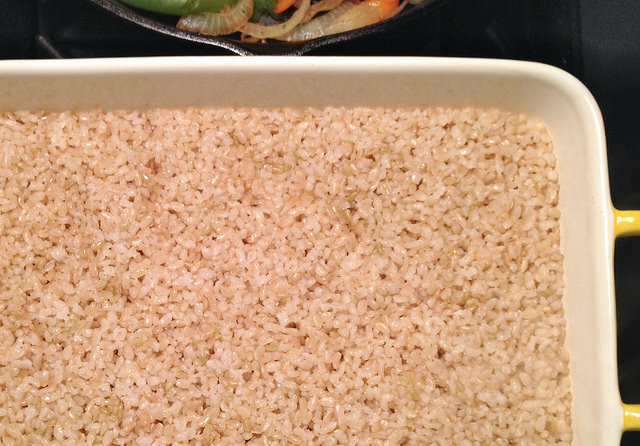 Yes, I regularly do a double batch (3 cups of rice) in a 9×13 pan and that works great! I think you would need a larger pan to do more. Or you could do 2 9×13 pans for a quadrupled recipe. I’m assuming it would do fine in a large roasting pan but haven’t actually tried it! So I might do 2 separate pans to be safe! Oh my GOSH– I am so glad to know that I am not alone with my inability to cook rice! I can cook, but rice has always been elusive. Thank you for this recipe– I may actually start cooking rice again! Haha – I know, every once in awhile I try again and it all sticks to the bottom of the pot and I think – nope, still can’t do it! 😂 This method has never failed me though!